I love samosa. Especially, the samosa stuffing. Anyone out there who hates samosa? 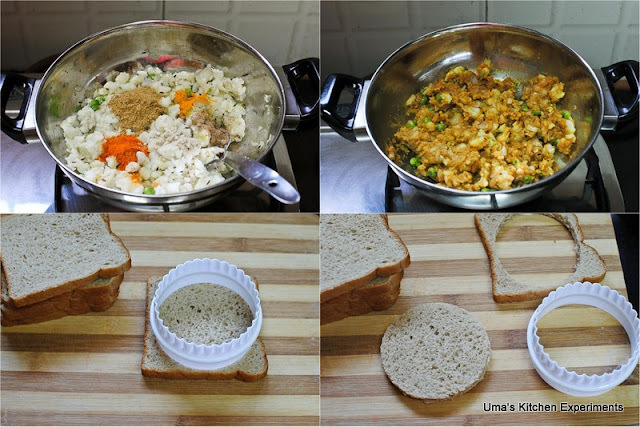 I often make samosa stuffing at home when I feel like eating samosa and instead of deep frying, I just bake it and sometimes, I use the stuffing for making sandwich or make masala dosa. 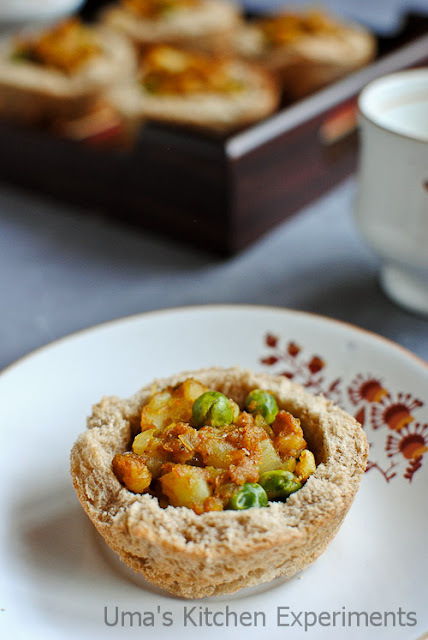 There are 'n' number of ways to use the stuffing and satisfy your samosa craving. 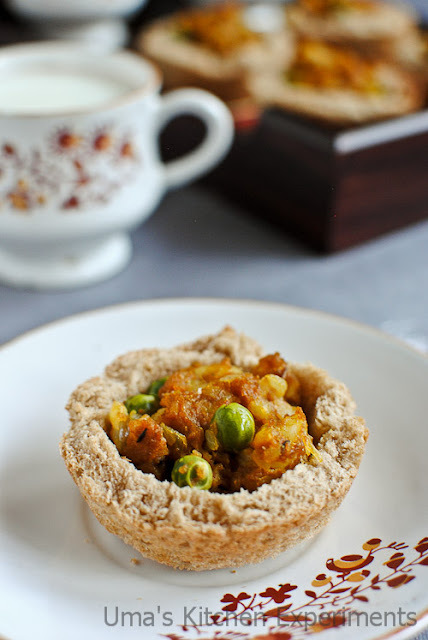 Once I used this samosa stuffing as a filling for the tortilla cups (click here to see how to prepare tortilla cups) and we totally enjoyed it. After that, I started using this filling in puff pastry, breads and so on. 1) Heat oil in a kadai / frying pan. 2) When the oil is hot, add the cumin seeds and allow it to crackle. 3) Add onion and saute till it is translucent. 4) Add ginger garlic paste. Saute for a minute. 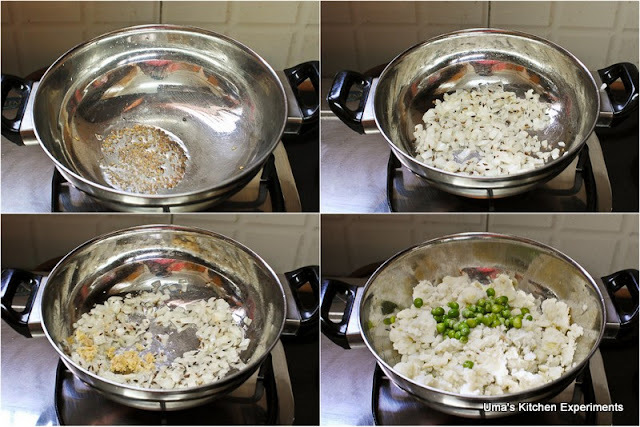 5) Add mashed boiled potato and green peas. 6) Add red chilli powder, coriander powder, chaat masala, dry mango powder, turmeric powder and salt. Mix well. 7) Cook till the raw smell of the masalas goes off. Say about 5- 7 minutes. 8) Garnish with coriander leaves and turn the flame off. 9) Now, take the bread slices. Cut the crust out of it. If you have a cookie cutter cut into a round shape. Also, save the crust. I will be sharing a recipe using the crust soon. 10) Place the shaped bread slices in the muffin tray as shown in the picture. This forms the cup shape. Make sure not to break the bread slices. 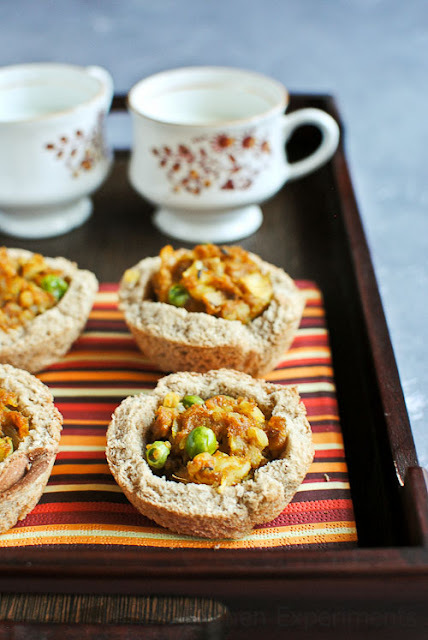 11) Place a tablespoon of samosa masala into each bread cups. 12) Bake it in the preheated oven for 10-15 minutes in the temperature of 150C(300F) or till the bread cups become crisp. 13) Take the muffins tray out of the oven and immediately transfer the bread cups to the wire rack. 2) Tweak the samosa stuffing as per your preference. 3) Make sure to transfer the bread cups to the wire rack immediately. Otherwise,the bottom part of the bread cups become soggy. 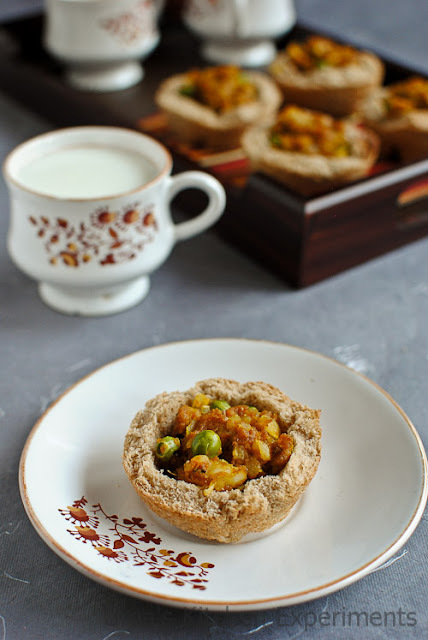 4) You can also bake the bread cups separately and fill the stuffing just before serving. very innovative idea uma.. liked your step-by-step clicks..
this is been in my do list for quite a long time.. i always love the way u prepare n ur clicks they r so so clean n it makes me crave badly.. Thanks All. Thanks Kalpana. Try it soon. Seriously they are quite addictive. Interesting idea... Would love to try it.. Thanks for sharing!! Nice idea of bread cups Uma! very innovative idea, looks so yummy. 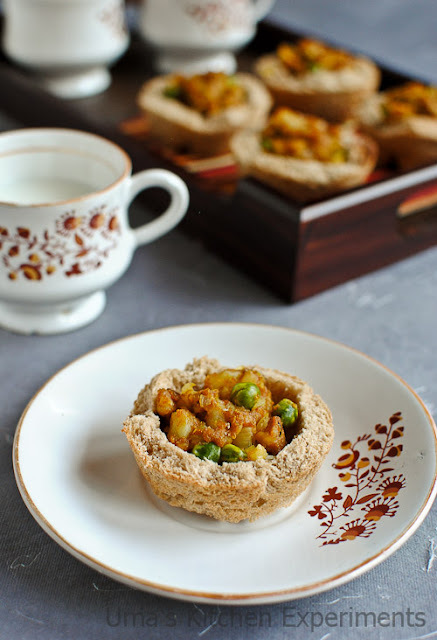 lovely... such pretty cups.. and i always use the aloo with bread.. but never in such a beautiful way! Love the idea of making cups with bread.. Superb idea. Amazing filled cups....fabulous.